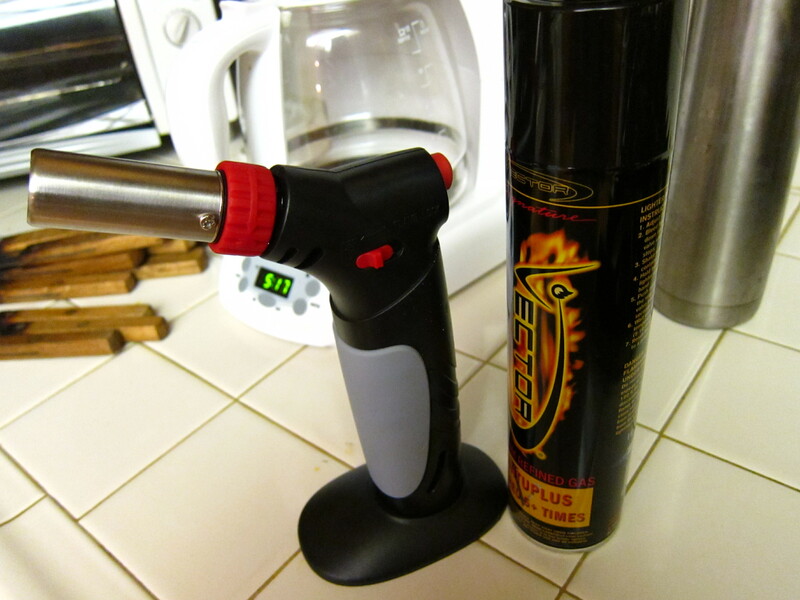 Enter, Kitchen Torch. I had my lovely excuse to finally by my kitchen torch! Oooooooh, Aaaaaaaah. Okay so then it was all pretty easy. I made my go to chocolate cupcake recipe which is a recipe from the Magnolia Bakery cookbook that one of Robin’s Aunt’s [Aunt Pinky] got for me last Christmas. Thanks Aunt Pinky! I’m putting it to good use! If you have ever gone to Magnolia’s bakery in New York, you know that they have the most delectable chocolate cupcakes. Their secret: buttermilk. 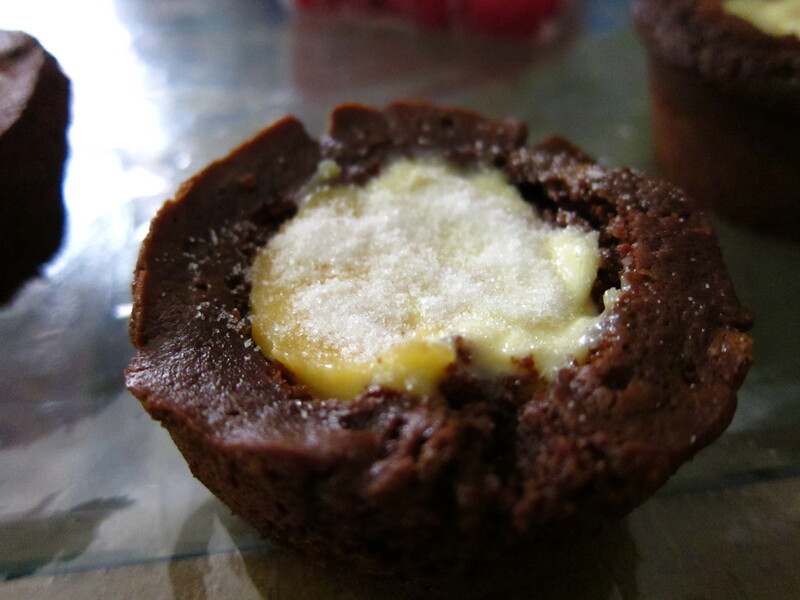 It makes the chocolate cupcakes simultaneously more dense but fluffy. So you bake those and then core a nice big chunk from their centers. So here is a fortunate mishap that occurred. As I went to line my cupcake tin, I realized I only had 4 cupcake liners. So I thought, oh well, let’s get out my handy dandy baking pam and I’ll bake them without liners. 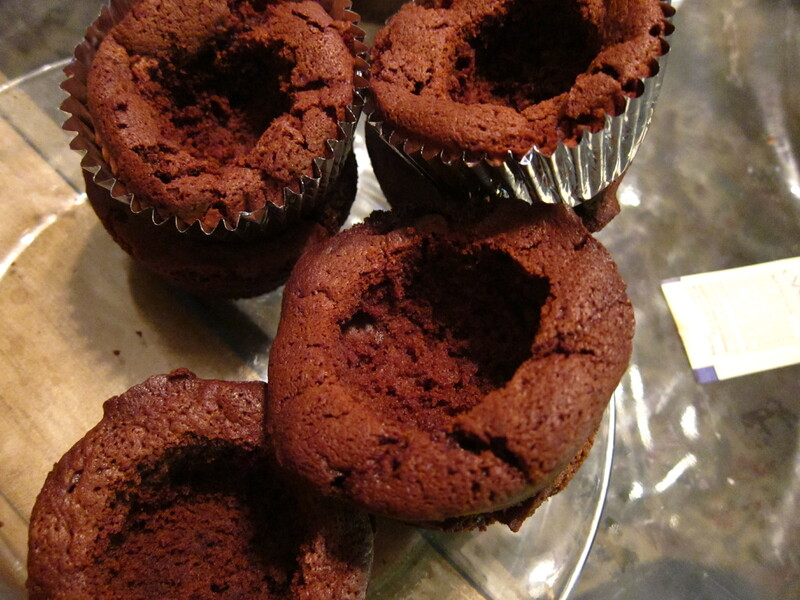 I found that the 4 cupcakes I baked with liners were less sturdy to cut into than the ones I didn’t have liners on. 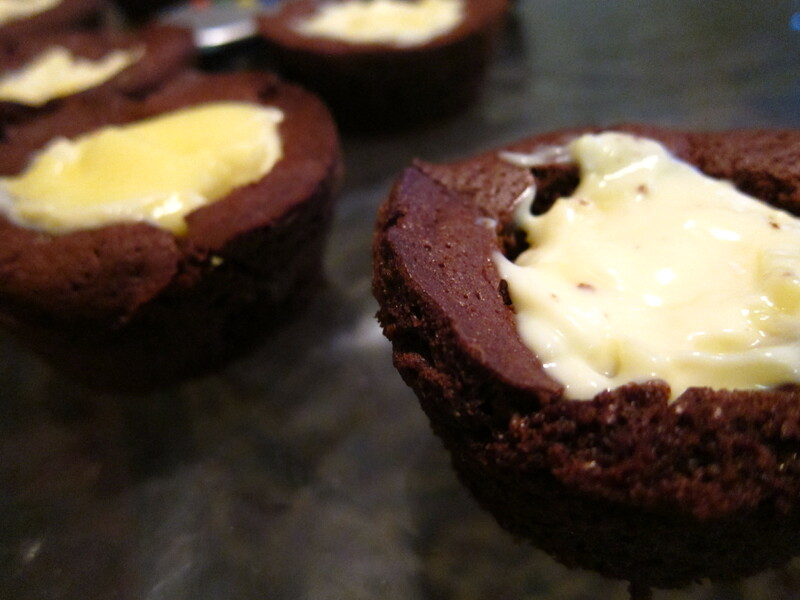 The sturdiness really helped me make clean nice holes without cracking the cupcake. Then you make your crème brulee. It’s actually really really easy. I baked the crème brulee in a large casserole dish because I was going to scoop it out anyway, but if you want you can put them in the porcelain ramekins that everyone is used to seeing them in. Make sure to add extra time if you are using a casserole dish [there will be a note in the recipe]. 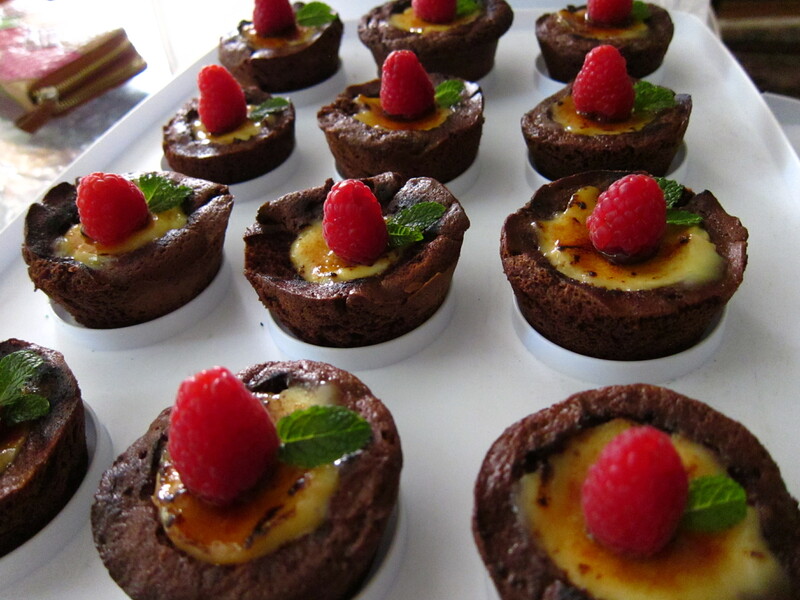 Make sure to let the crème brulee cool completely. That means at least 2 hours, I would recommend 1 hour outside and 2 hours in refrigerator. 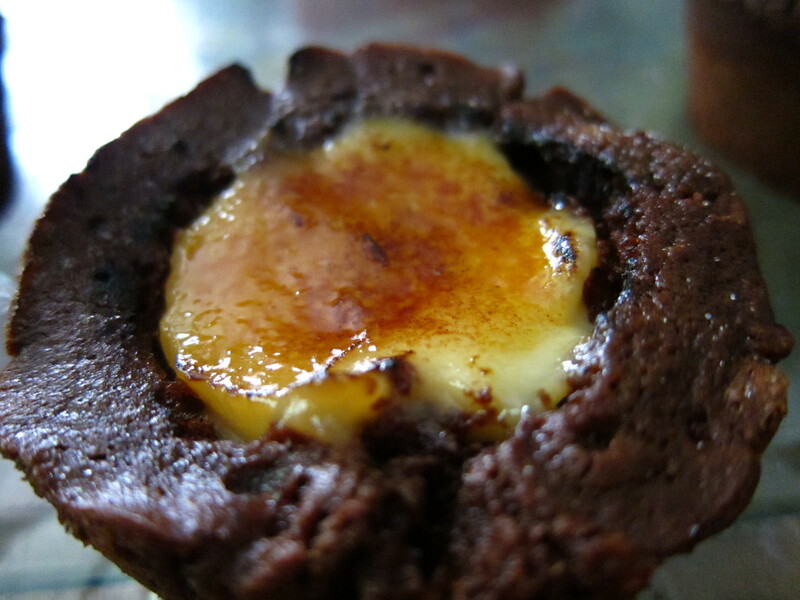 Once the crème brulee is thoroughly cooled, just scoop the crème brulee into the cupcakes. I would have liked to have a bit more crème brulee to have the crème brulee mountain out more from the cupcake rather than be flush with the cupcake [which is how mine ended up]. 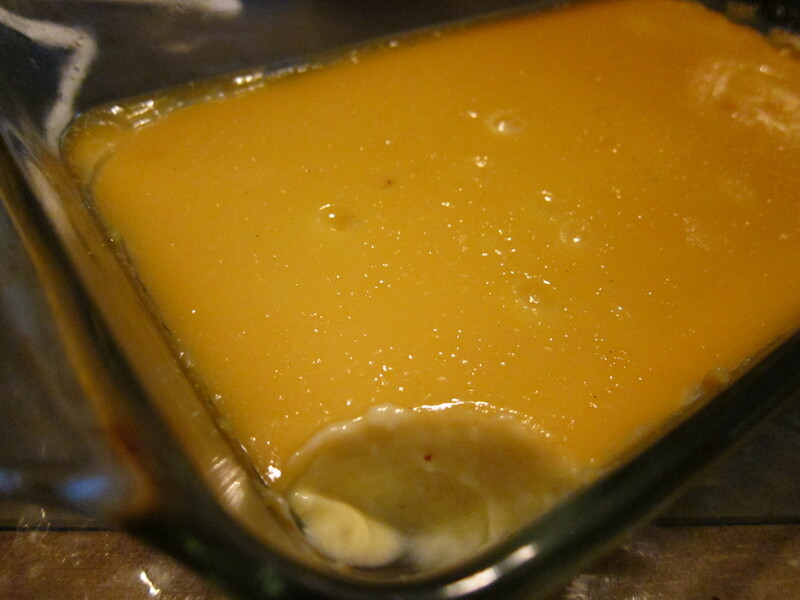 So, I would say make 1.5 times the recipe of the crème brulee. But, if you like the flush look then just go with this one. 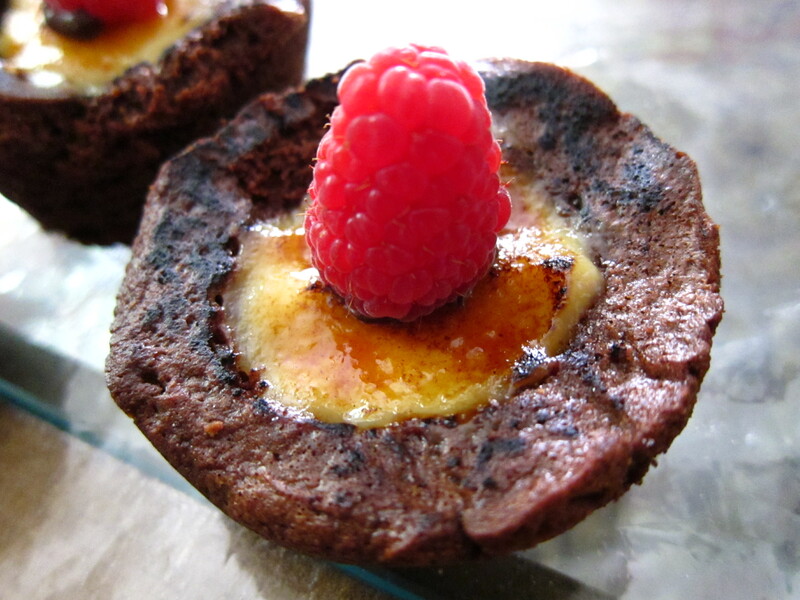 I say I would like it to mountain more because when I got to the brulee part of the crème brulee, I had to figure out how to gauge the temperature on my torch so I didn’t burn the cupcakes as well. It took a few tries, but I finally figured it out haha. 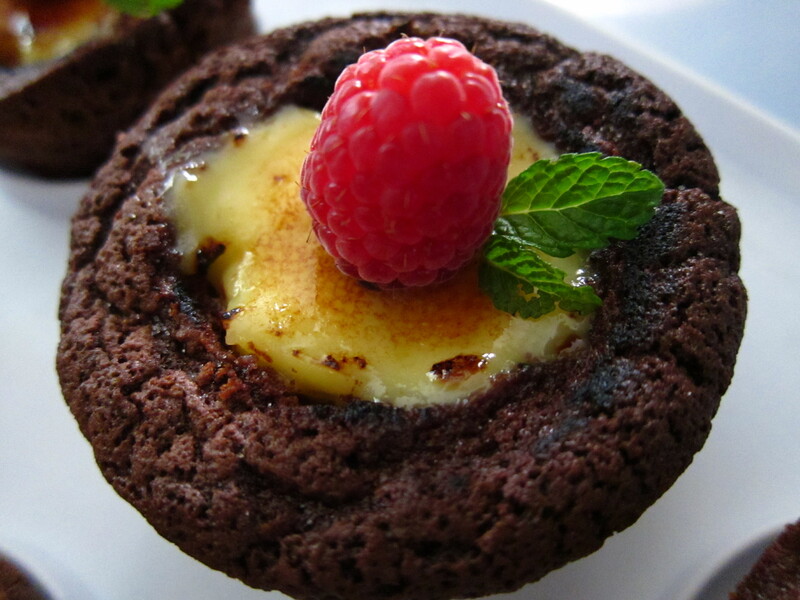 Anyway, so once the cupcakes are all filled, then you take your sugar [I would recommend Demera sugar, it is especially for crème brulee. But, it you can’t find the Demera sugar just use regular sugar, which is actually what I did. I do believe, however, that Demera sugar creates a thicker and crispier top layer] and sprinkle a thin-ish layer evenly on the crème brulee. Then torch it!!! This part was so much fun, as you can imagine. To finish it off I topped with one raspberry. To help the raspberry stick I melted some bittersweet chocolate and dipped the ends in the chocolate and then topped the cupcake. Then I went to our garden and clipped some baby mint leaves and used those to add the finishing touch. Overall, the cupcakes were a fabulous hit! Hope you enjoy! 1. Combine and bring vanilla paste, 1 cup of the cream, granulated sugar, and salt to a boil over medium heat. 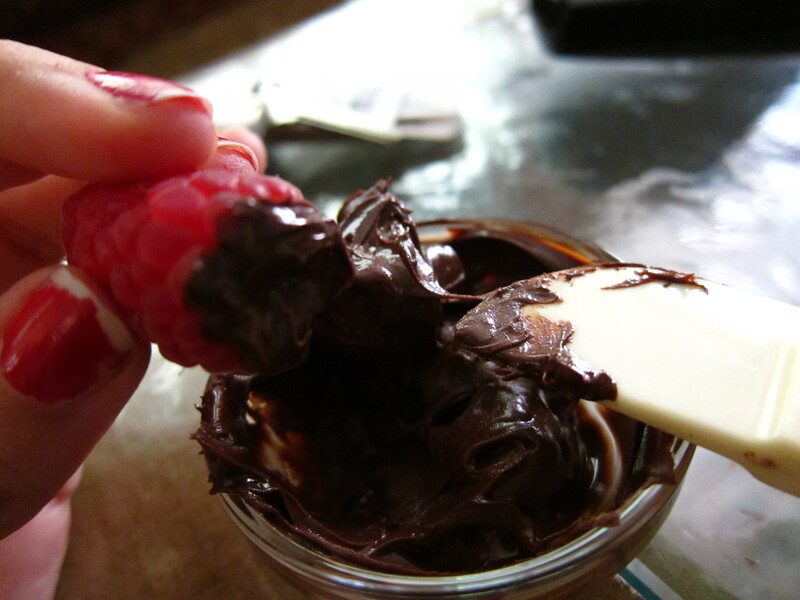 Stir every now and then to prevent the cream from forming a skin. Once boiled, remove the pan from heat and let steep for 15 minutess. 2. After the mixture has steeped, stir in the remaining cup cream to cool down the mixture. 3. Whisk the egg yolks together in a large bowl until uniform. While whisking eggs with one hand use your other hand to slowly pour in the cream mixture. 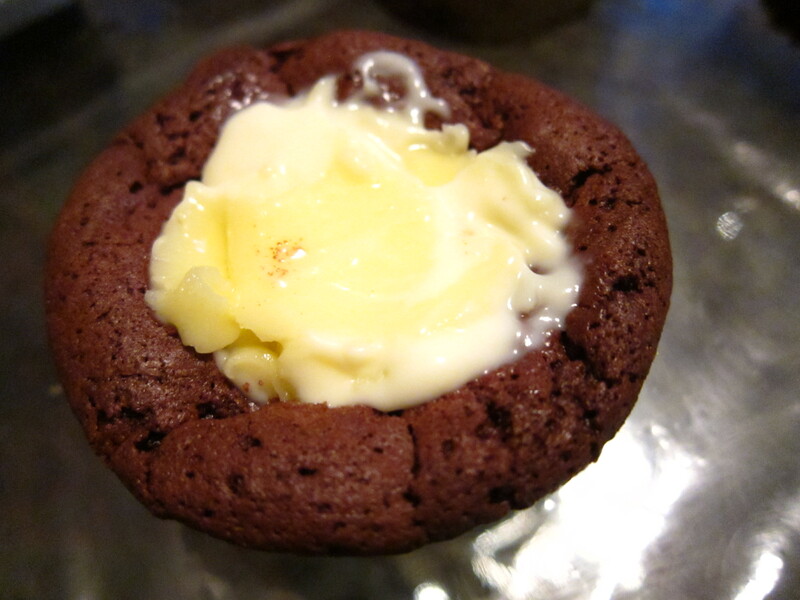 Make sure your cream has cooled enough so that your eggs will not curdle. Push final mixture through a fine mesh strainer, discarding any solids. 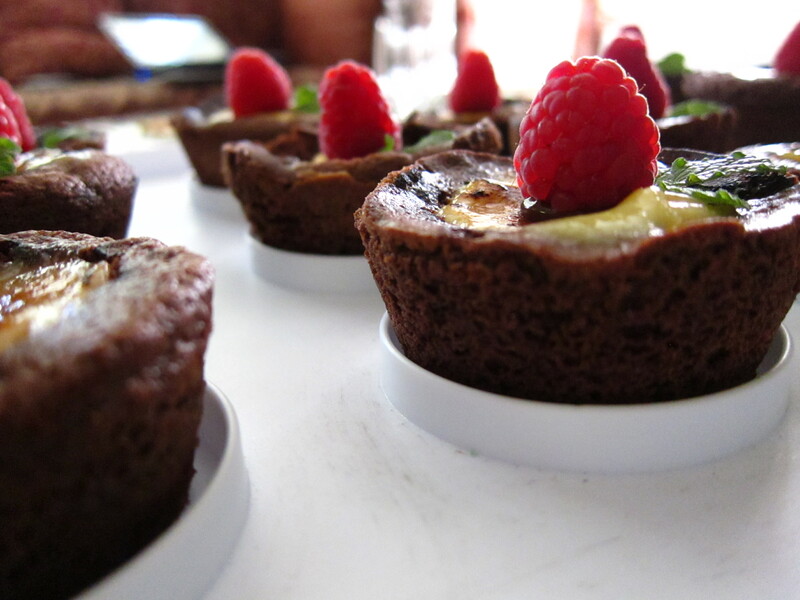 Pour into the ramekins. 4. Boil a kettle of water. 5. Place custard filled ramekins into a pan filled with boiling water. I put my crème brulee in a casserole dish. Then I place it in a deep pan and placed that in the oven. 6. Pour boiling water into pan, being careful not to splash water into ramekins. 7. Bake for approximately 60-90 minutes or until custard either reads 170 degrees and/or until custards gives a gentle wiggle when moved. 8. Transfer baked ramekins to cooling rack. Cool to room temperature for approximately 2 hours. I would say 3 to be safe! 9. To store, place plastic wrap directly on custard surface to prevent skinning. This is important because the skin makes the custard look uneven when you fill your cupcakes. Preheat oven to 350 degrees. Line two 12 cup muffin pans. 2. 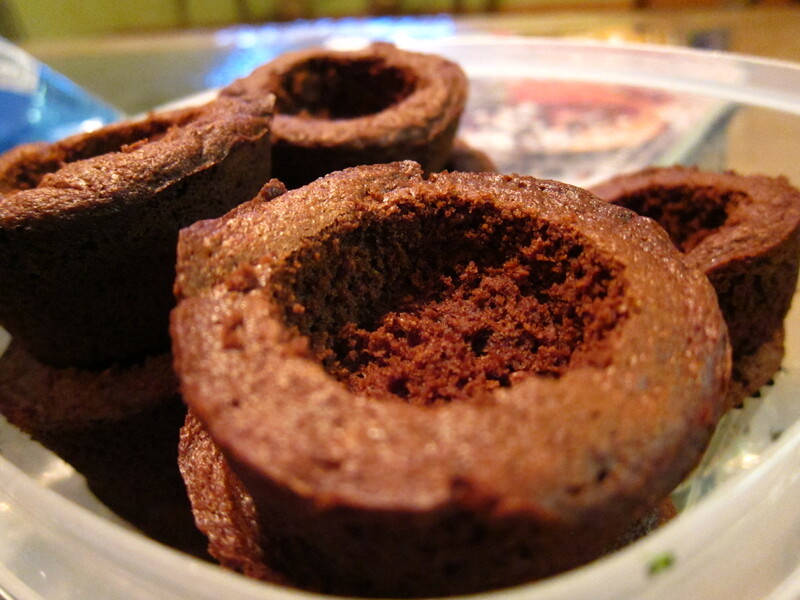 Line two 12-cup muffin tins with cupcake papers. [or use baking pamJ and forgo liners] Set aside. 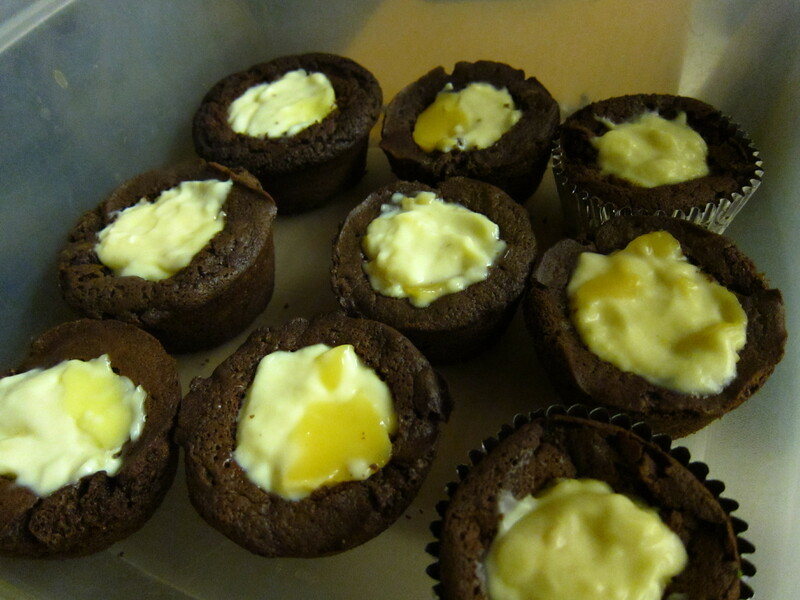 5.Cool the cupcakes in the tins for 15 minutes. Remove from the tins and cool completely on a wire rack before filling with custard. 1. 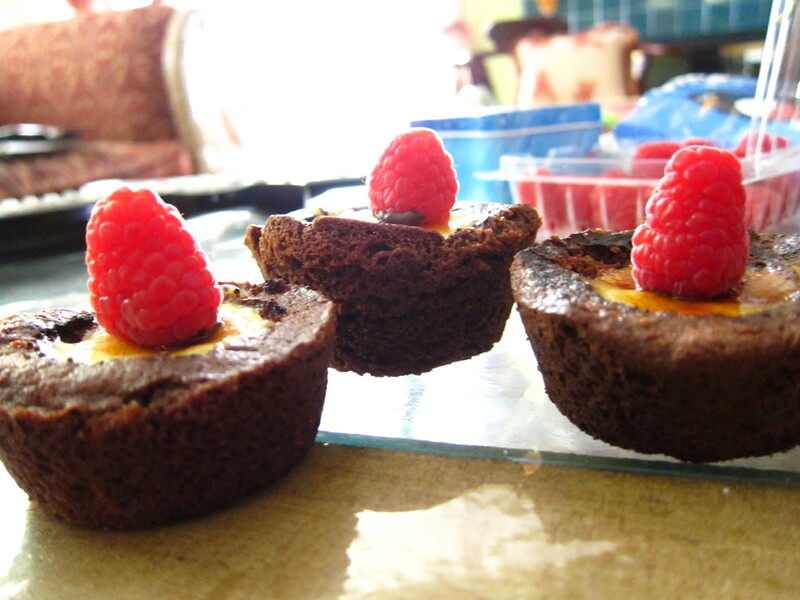 Using a paring knife cut a shallow cone from the top of the cupcake. 2. Fill hole with custard. 3 Generously sprinkle Demera sugar on top of custard. 4. Keep torch six inches from sugar to brulee.